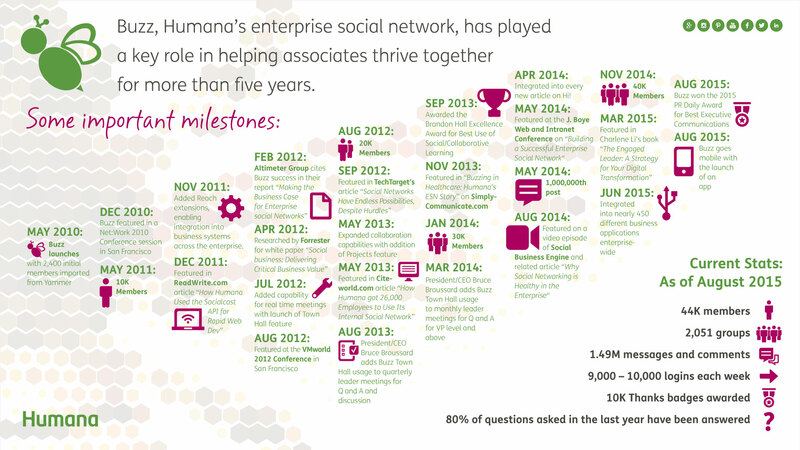 I am an online community manager for Humana, a Fortune 100 company headquartered in Louisville, Kentucky. I enjoy being the community manager for our enterprise social network (ESN) called “Buzz” that was launched in 2010. I also co-created our employee advocacy program with my colleague Jason Spencer and now enjoy watching my colleague Nick Wallander oversee it. I’ve enjoyed having a hand in other internal and external online communities established to serve the needs of various audiences. It has been my pleasure to work at Humana since 2003. In 2013 I founded the weekly Twitter chat on enterprise social networking – #ESNchat – now co-hosted by a great team of others on Thursdays 2-3 p.m. Eastern time. As an avid social media/social learning enthusiast and lifelong learner, I am particularly interested in how social technology and online communities are used to meet the needs and solve problems of individuals and groups both inside and outside the company. As a community manager, I live and breathe the communities for which I gratefully have responsibility. I am thankful to many wonderful colleagues and excellent business partners for helping to make all of the above possible. You make my work a joy! When I’m not working, I enjoy my wonderful family, devoted dog, drinking Ale-8 (a soft drink made in my hometown of Winchester, KY), supporting the Kentucky Wildcats, and being an active member of my church in Louisville, KY. Thank you, Scott, for being here and for what you do on your blog as well.